What are Denamarin Chewable Tablets? Denamarin Chewable Tablets are a nutritional supplement containing S-Adenosylmethionine (225 mg) and Silybin (24 mg) to provide a multi-faceted approach to liver support. Denamarin combines pure S-Adenosylmethionine (SAMe) with Silybin to provide a one-two punch to keep your pets liver healthy. Silybin supports the flow of bile through the liver which helps with the digestion and absorption of nutrients from your pet's diet. Silybin also helps to regenerate liver cells and may enhance levels of glutathione, an antioxidant that helps to protect cells from toxins such as free radicals. 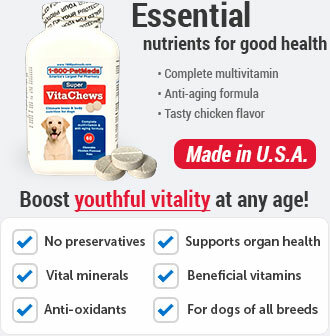 It comes in a pork liver flavored chewable tablet that most dogs love. Store in a cool dry place, not to exceed 86°F. Denamarin Chewable Tablets for dogs of all sizes is a patented nutritional supplement for veterinary use in dogs. Denamarin combines a pure and stabilized S-Adenosylmethionine with Silylbin to provide a multi-faceted approach to liver support. 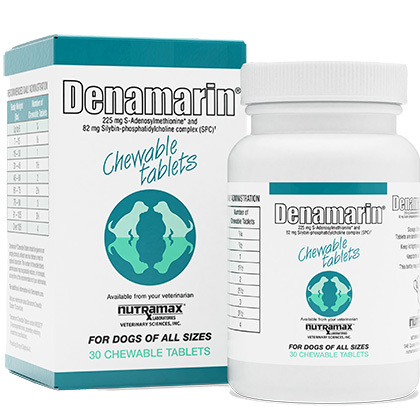 Denamarin Chewable Tablets is a non-prescription (OTC) product available in bottles of 30 liver flavored chewable tablets for dogs of all sizes. 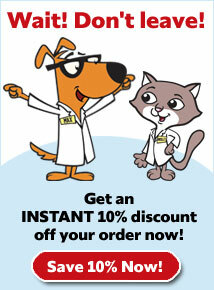 The daily dose for dogs up to 6 lbs is 1/4 tablet. For dogs 7-15 lbs give 1/2 tablet. For dogs 16-30 lbs give 1 tablet. For dogs 31-45 lbs give 1 nad 1/2 tablet. 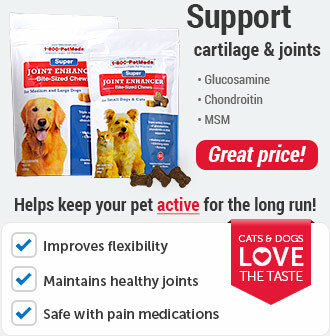 For dogs 46-60 lbs give 2 tablets. For dogs 61-75 lbs give 2 and 1/2 tablets. For dogs 76-90 lbs give 3 tablets. 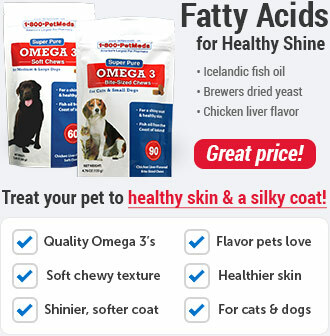 For dogs 91-105 lbs give 3 and 1/2 tablets, and for dogs over 105 lbs give 4 tablets. The tablets should be given on an empty stomach at least one hour before a meal for optimal absorption. 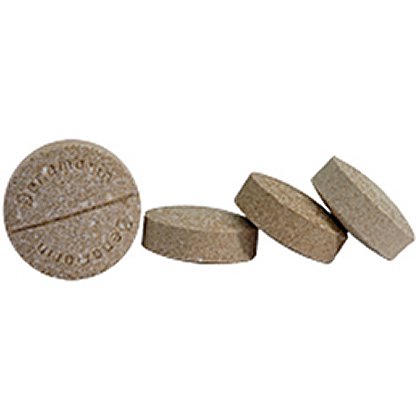 For owners who find it difficult to administer tablet(s) to their pets, Denamarin may be disguised in a small bite of food. The number of tablets administered may be gradually reduced, or increased, at any time at the recommendation of your veterinarian. There are no reported side effects when used in dogs. 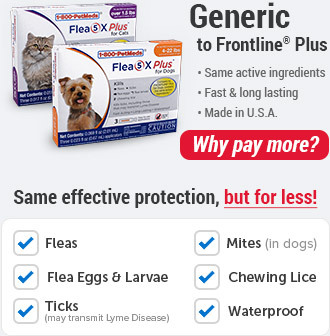 This product is for veterinary use in dogs only. Denamarin Chewable Tablets should be given on an empty stomach at least one hour before a meal for optimal absorption. 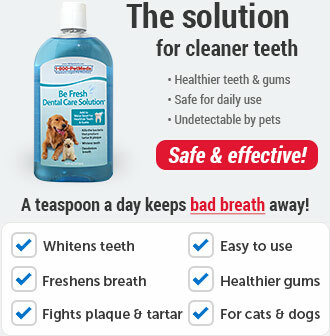 Denamarin Chewable Tablets are sensitive to moisture and heat. The bottle contains 1 non-toxic desiccant to help preserve freshness and ensure the shelf life of the product. Store in a cool dry place not to exceed 86 F. Keep bottle closed with desiccant inside when not removing tablets. Tablets are sensitive to moisture and heat. Please refer to the chart below for dosing recommendations. The number of chewable tablets administered may be gradually reduced, or increased, at any time at the recommendation of your veterinarian. The tablets should be given on an empty stomach at least one hour before a meal for optimal absorption.